← Too old for Mickey Mouse? Until quite recently, figs were one of those foods I didn’t really know much about and had for some reason decided I didn’t like – having never actually tried them. I think my dislike was something I’d carried from childhood and had more to do with those horrid fig biscuits than the fruit itself. I didn’t like those one bit and I still don’t. At least I think I don’t. Then, one hot Summer’s day in France, whilst taking a walk, I slipped on a carpet of squashed figs which were completely covering the road. I remember very clearly thinking how much I loved that smell and – being somewhat affected – it reminded me of my favourite scented candle. Anyway, in amongst that slightly materialistic association, it made me curious about figs and I’m pleased to say I’ve loved them ever since. The real ones, not the candles. I’m a bit over the candles. Although I do know someone, a man, who wears a figgy scent and it does create the most delicious perfume. So, we’ve been enjoying French figs for the past few years but had never found really good ones in England until we discovered our – almost – very own fig tree, right here in Oxfordshire. And now that we have more figs than we really know what to do with, there are all kinds of plans to make all manner of things. Neither candles nor perfumes, but maybe jams and chutneys – who knows. For now we’re happy just eating them greedily. 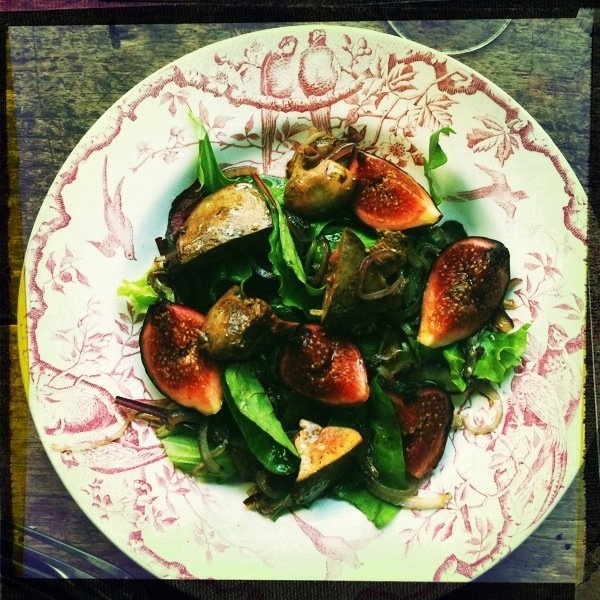 I think the most delicious way to enjoy figs is hot. You can bake them with all sorts. I like them wrapped in prosciutto and stuffed with a little bit of roquefort cheese. All you need to do is score the figs in to quarters, but not all the way through. Just enough to open them up. Stuff your cheese inside and then wrap closed with a piece of thin prosciutto ham. Drizzle with a little bit of olive oil and put in the oven until the cheese has melted and the ham has crisped up slightly. About 10 minutes depending on how hot your oven is. Serve with some salad leaves and perhaps a little olive oil and good balsamic and that’s it. Or you can score them as above, put a dollop of honey in the middle, wrap them in the prosciutto and cook them in the same way. Or you can miss out the ham altogether and just go with the honey or the cheese. All very delicious indeed. So that’s my post about figs. Really it was all an excuse to show this photograph which I think is just about the prettiest fig picture I’ve ever seen. Sarah has a huge fig tree and we have just been mad at the mess it makes because squashed figs attract insects and the children use them as missiles. After your encouraging story maybe we can start afresh and after using one of your recipes we might like them too! !